THE ROMANTIC MUSE: Good News! - Carolyn Wren Signs the Protector Series! Good News! - Carolyn Wren Signs the Protector Series! The girls here at TRM are happy to annouce that Carolyn Wren has signed her seven book series, The Protectors Series, with Secret Cravings Publishing! Carolyn's debut, Diplomat's Daughter is now on pre-order on the Sweet Carvings website, so don't waste another minute and head on over to grab yourself a copy! Feb 2013 Book 2, The Scientist. Simon Winters, the charismatic agent known for his love of danger is given the task of protecting scientist Elizabeth Barrett while she completes her research. 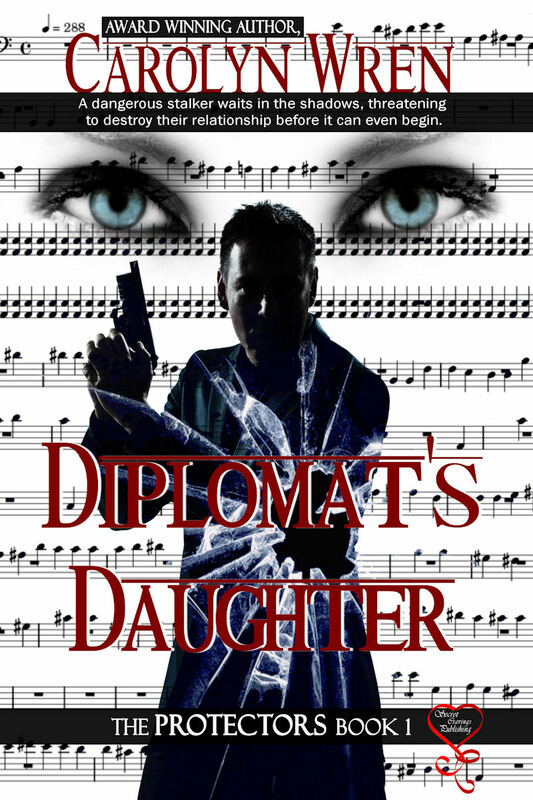 What seems like a straightforward mission turns deadly when it seems someone wants her and her research dead. April 2013 Book 3, The Actress. Bryce Black, the technical wizard of the Protectors agency does not normally do personal protection assignments but he falls for Katrina, the famous television actress under his care, and when she is kidnapped by an obsessed fan, does everything in his power to find her. June 2013 and later in print,Book 4, The Hostage. 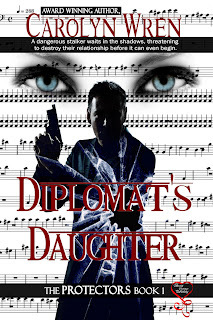 She is known only as Omega, and when businessman James Northam is rescued from a desert terrorist compound by this enigmatic and secretive agent he is determined to track her down and thank her. But someone else wants to find her too, for much more sinister reasons. August 2013 Book 5, Widowers Child. Jane Preston is new to the Protectors agency. Her first assignment is a recommendation from Meg, formally known as Omega to watch over the five year old child of wealthy Paul Foster after a kidnap attempt. Jane begins to suspect there is more to this story and that Paul is keeping secrets from them all. October 2013 Book 6, Undercover Agent. Lucien St John has been working undercover for over 2 years as finance officer to corrupt Russian businessman Karl Cheknov. In order to finally penetrate Karl’s private empire Lucien needs a fiancé and the only person available is retired agent Jade, now working as a personal assistant for the head of the Protectors agency. When the assignment turns dangerous these two vastly different people must overcome their aversion to each other and work as a team. Dec 2013 Book 7, Secret Family. Peter Sinclair needs to find Amity Blake who has posted a picture online of someone she believes to be her long lost father. The picture is of deceased agent Cal Davies, a man with many enemies. Peter must protect her then send her on her way to begin a new life before someone tracks her down and takes their revenge on Cal’s only living bloodline. From the rest of TRM girls.